Keith Thurman ExclusiveKeith Thurman has never been short on confidence. Keith Thurman has never been short on confidence. It really began to register on people’s radars during his fight against Diego Chaves for the interim WBA welterweight title back in 2013. Thurman led on all three cards during that fight with scores of 87-83, 87-83, 86-84 thanks in part to a knockdown in round 9 which was the beginning of the end for Chaves. Thurman displayed his extremely effective body shots the entire fight and finally dropped Chaves in the ninth before taking him out with a hook to the body and a huge overhand right to the forehead in the tenth round. From there Thurman would stop Jesus Soto Karass and Luis Collazo along with a body count that included the top tier names of the division: Danny Garcia, Leonard Bundu, Robert Guerrero, and a controversial win over Shawn Porter among others. Titles now under the Thurman era include the WBC and the WBA belt he started with. Now with Errol Spence holding the IBF belt and Jeff Horn holding the WBO title, Thurman would like to solidify his dominance by possessing all of the jewelry in the game. 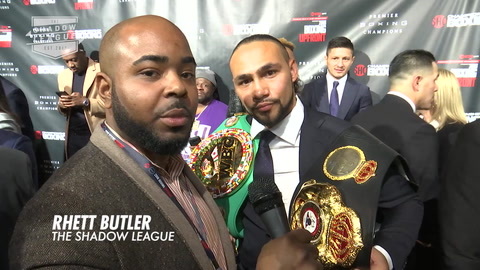 “There will be a time, not today, not tomorrow, but this time is coming very soon where I believe there will be one champion at 147 (lbs),” said Keith Thurman to The Shadow League at the Showtime Boxing Upfronts held at Cipriani’s in late January. With former undisputed light welterweight world champion, Terence Crawford now entering the welterweight ranks with a feverish buzz, Manny Pacquiao still fighting in the division, and Errol Spence calling Thurman out daily on social media, the world is watching Thurman’s next moves hawkishly. When it comes to Crawford and Spence, Thurman sees the upside to those matchup with more clarity.